Can ITER transform the future of digital hydraulics? ​The total number of the ITER components, their weight and size are truly impressive. The biggest fusion machine in history, counting at least one million pieces of equipment, will weigh approximately 23 000 t and will be housed in a 60 m high building. Everything about this project is a supersize shifting our mindset from "standard" fusion experiments currently in operation. Industry has already entered unchartered territory manufacturing ITER's complex components. They are in progress and will be shipped at different stages from all over the world to Cadarache, where they will be assembled and carefully positioned. Everything needs to fit in the limited space reserved for each component, and as if this wasn't complicated enough, the tooling that will be used to repair them will also need to be developed from scratch. At times, technical maintenance will need to be carried out remotely and with extreme precision. Engineers will not be able to enter the machine. They will need to rely on cameras and use agile and smart tooling to access a labyrinth of equipment. One example is the ITER Divertor, located in the lower part of the machine, consisting of 54 cassettes measuring 3.4 x 1.2 x 0.6 m weighing 10 t each. This is the part of the machine where the temperature of the superhot plasma will be felt most. The divertor cassettes will form the machine's massive "ashtray" where the hot ashes and impurities will be diverted to, and eventually, fall in. It is foreseen that these components will be replaced up to three times during ITER's lifecycle. Europe is responsible for the development of the ITER Divertor Remote Handling System and one of the tricky subjects that F4E and its industrial partners are dealing with is choosing the right technology to lift and handle the heavy divertor cassettes. The digital hydraulic valve is the result of collaboration between the Tampere University of Technology, Fluiconnecto and Tamlink. The EU has financially supported this initiative. Originally, F4E was considering using servo valves as part of the remote handling system. Although, they offered accurate tracking, tests showed that they lacked robustness and wore off easily. On top, any particle in the water could block their operation causing significant problems. For this reason, F4E signed a contract with Tampere University of Technology (TUT), Fluiconnecto Oy and Tamlink Oy to explore the possibility of using digital valves as an alternative. The system relies on a set of 16 fast, small and simple on/off valves working simultaneously to achieve the required performance. After months of trials, the engineers have concluded that the digital valves present several merits. First, they are more resilient. Second, contrary to servo valves, where the system relies solely on one, digital valves offer a combination of various valves and in the event of failure there is a backup to fall back on guaranteeing continuity. Third, as trials pointed out, the digital valve system demonstrated a new state-of-the-art control performance. The successful results have motivated TUT, Fluiconnecto and Tamlink to explore the commercial potential of this technology. Digital water hydraulic valves could be used in the fields of transport, aeronautics, construction, industry and machining. Where there is a need for extra muscle to lift and move loads with precision, there is a niche for this promising patent. Tamlink and TUT have been working the last 20 years in this field. For example, Bosch Rexroth has licensed this technology operating with oil. In fact, digital oil valves of such kind are used in some of Finland's high speed trains. One would think that the same valves could be used in ITER. But the technical requirements state clearly that oil cannot be an option. Salvador Esque, F4E Technical Officer following the contract explains "…due to the restrictions we have with the use oil when moving the ITER components in vacuum and under radiation, we started looking for alternatives. We decided with our industrial partners to opt for water. Now, we have a solid basis to explore this technology further and to validate it. We will soon be starting with the second phase of tests replicating the ITER environment and we will be upgrading the valves." F4E has made this breakthrough possible by co-financing a number of improvements to the valves' design. The grant helped TUT to conduct trials for hundreds of hours using a test load simulating the weight of an ITER divertor cassette. The EU's involvement in ITER and the potential to stimulate spin-offs are important to Carlo Damiani, F4E Project Manager for Remote Handling. "This is a success story that could yield commercial benefits. The collaboration of R&D centres and companies, making the transition from fusion to other areas of work, shows the diverse mix of technologies we use and their far-reaching application. It is another example demonstrating how the EU can further increase Finland's high rank in innovation." Lauri Siivonen, Tamlink Project coordinator, believes that digital hydraulics are a strong candidate for ITER. "The tests showed superior tracking accuracy. In spite of some faults detected during the long-term tests, their performance overall was not seriously affected. The project was carried out in line with the scheduled time and resources." Harri Sairiala, technical responsible of Fluiconnecto adds "…we have been working with ITER water hydraulic maintenance tools for almost 20 years. The digital valve technology paves the way for new interesting possibilities to achieve reliable, accurate and efficient motion control. ITER is probably the most demanding environment we can imagine for a hydraulic system. If we successfully address this challenge, then we will have many possibilities in more traditional industrial applications in future." 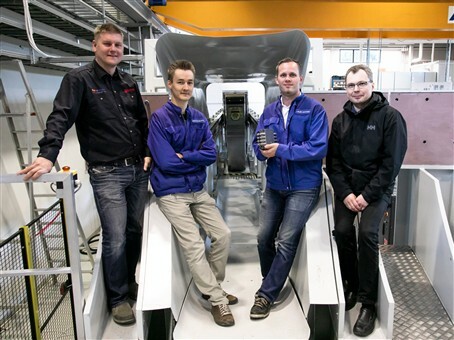 Matti Linjama, Adjunct Professor at TUT, and inventor of digital hydraulics, explained that "this joint venture with F4E, Tamlink and Fluiconnecto has been fruitful. The digital hydraulic solution offers a unique combination of performance and reliability. The project is a good example of transferring research to an application." Next, the digital valves will be installed in the Divertor Test Platform (DTP2), an ITER test facility in Tampere. On the basis of their performance, experts will decide how to use them in the biggest fusion device.